I never met Greg Porter or Mark Walker. Never had a conversation with either of them on the phone, or even exchanged e-mails. 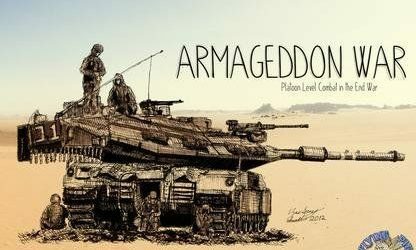 Still, we had a long talk when I opened the box to Armageddon War and started reading the rules. 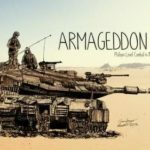 Which are not only surprisingly easy to follow, but also put you in a long conversation with the designers about what they are trying to do with their game and how they are folding their fantasies and views of reality into this fictional future combat in the Middle East. The conversation started when I noticed that the rules weren’t just telling me things like tanks have a movement factor of 6 and a combat strength of 11. 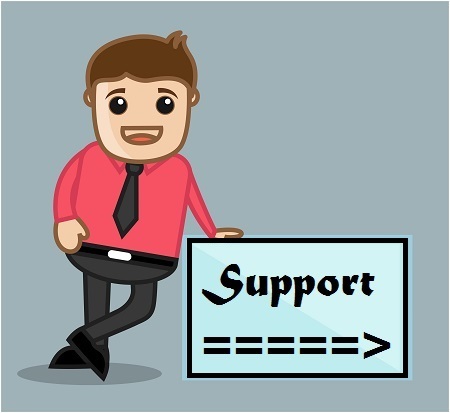 They tell you what to do, why you are doing it, and what is likely to happen. And, it’s done so smoothly that you are deep into the game before you notice it. 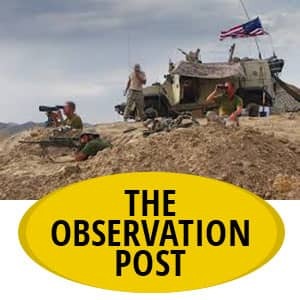 After all, you’ve just been having a pleasant talk about how roads in heavily wooded areas channel tanks and leave them open to attack, and how minefields really don’t blow up vehicles, only slow down movement as their crews work to spot and clear those mines. Then the chaos is unleashed. 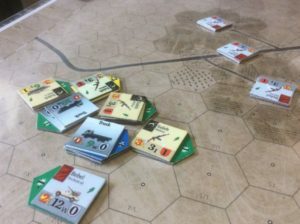 You will quickly find out that it’s one of those games that has its own take on the meaning of random, and its dice rolling attacks takes a little getting used to. There are even some scenarios where the attackers may decide to weaken their combat strength to avoid civilian casualties. Players don’t exactly take turns. It’s all a random draw. And movement and combat aren’t the neat things most game players are used to, since they tend to flow into each other. It takes a half move to unload an APC, but when that APC is attacked later in the round by an enemy tank, the defensive fire changes depending on how far it moved after unloading. It all flows very smoothly. 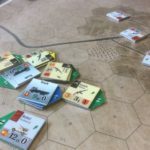 It almost made me forget the one iron-clad rule that keeps popping up in most of the war games I have played over the years. You can never, never overstack a hex. Even here, they neatly explain why you can’t have more than 80 men in a hex representing an area the size of several football fields. But, before we get to the game, one small aside. 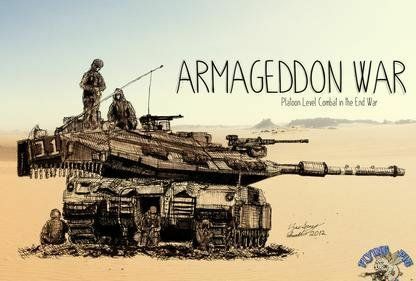 Armageddon War’s cover says it is a Mark Walker game and a Greg Porter design, but the credit box lists Porter as the game designer and graphic designer, while modestly listing Walker only as a playtester. I don’t know if I want to know why. Whoever did what, it works. Now, let’s look at some of the things that make this game go. Simple stuff first. Armageddon it’s not. At least not in the biblical End of Days sense. It is a view of what might happen in the Middle East in 2028, with both the United States and Russia split by internal power struggles and resurgent rebellion breaking out in the Middle East, eventually drawing both superpowers into the conflict. 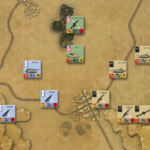 The designers start with simple platoon-level combat and overlay it with a wide range of weapons, most conventional, some futuristic, some newly-developed and untried. Some obsolete. Some are robots. Then they give you a bag of six-sided dice. Three colors. Futuristic symbols. First really creative step you will encounter. Forget your standard charts and odds ratios. These dice have special symbols – shields and stars. The ratio of symbols is different on each color die, and it represents weak fire, normal fire, and intense fire. Each combat counter has a number on it, showing how many dice it rolls (with modifiers). Also range and weapon type. The counters are large so there is lots of room. Don’t assume the shields protect the target. They are counter-fire. Yes, you shoot at someone and they are shooting back at you, all on the same die. You can roll up to six dice depending on weapons and modifiers. Now, units from every national group – there are five of them – are organized in formations and you draw chits to activate them. If you shoot, you calculate modifiers that can change the color of the die you are using. Being in cover, for example, forces your opponent to roll a weak green attack die against you instead of a normal black one. 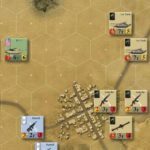 Every scenario in the back of the rulebook lists the kind of terrain and which map (or map section) you will be fighting over, as well as rules for do-it-yourself scenarios. But, it’s not one side move, other side shoots, or even one side moves and shoots, then the other does. That would be too simple. In Armageddon War, every formation on the board – regardless of nationality – has an activation chit. All their chits go into a hat (or a cup) at the start of each turn, Pick one and all the units in that formation take an action: move or shoot or regain morale or some combination of those things. The rules explain it clearly, but – generally – if you move or get out of a vehicle, it reduces your firepower. 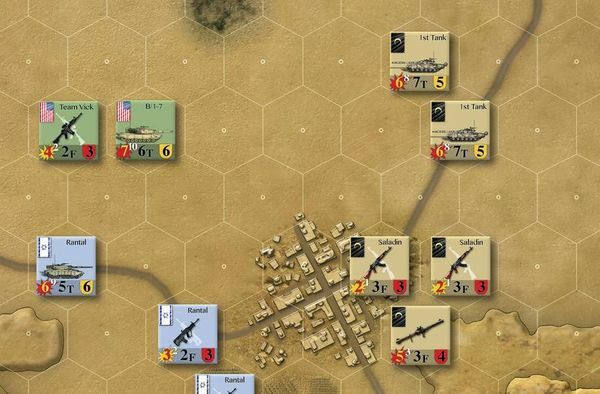 Opportunity fire is allowed, but you can only shoot at one unit and into one hex, so if two units are firing at two enemy units that move from one hex to another, only one of them can be attacked. Units that have come under fire and are disrupted (good order becomes pinned, and pinned becomes shaken) recover at different rates, depending on terrain. You can fire at extended range, but only at half strength. If this is beginning to sound like a miniatures game, you are getting into the flow of things. 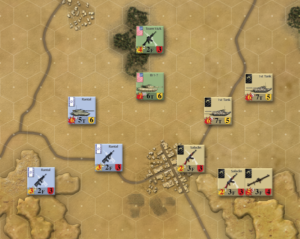 Now, we can add the fact that different weapons have different combat effects depending on their target, or that special weapons like indirect fire and precision munitions are waiting to be added to the battlefield in the advanced rules. 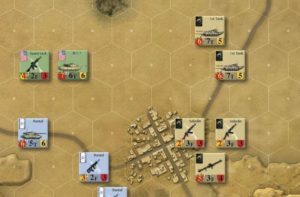 For die-hard players, you can pick and choose in the advanced rules and add friendly fire, snipers, smoke and dust to block line of sight and even those four mystery counters labeled A, B, C, and D. Yep, hidden units. You can also hide prepared positions, which make your troops harder to hit. Surprise! Want more surprises? 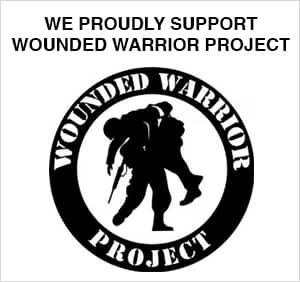 There are helicopters, IED’s, barricades (urban warfare is tough) and if you shoot at a target in a building, a group of civilians may come rushing out. You can, of course, decide to use only green dice in your attack, because they do not have two stars (* *) on any face. You don’t have to play all 15 scenarios in the rule book to enjoy what the designers are up to. Just reading them – the assassination attempt and the dirty bomb scenarios come to mind – are fun to imagine playing without ever putting a counter down on the map. And, to be honest, I haven’t even tried out a do-it-yourself scenario, so I can’t say how well the point system the game provides to balance out different forces actually works. Did I mention that the counters and the graphics are really neat? The map with the desert town on it looks amazing from a top down view, very impressive! I have played plenty of PC games dealing with modern warfare but when it comes to board games I always seem to end up in the past. Good review, seems like a very intriguing game. Thanks for the post. Mitch is a good friend and a retired reporter for Newsday. So I’m not surprised at the quality of his work. I am lucky to be able to publish his articles.